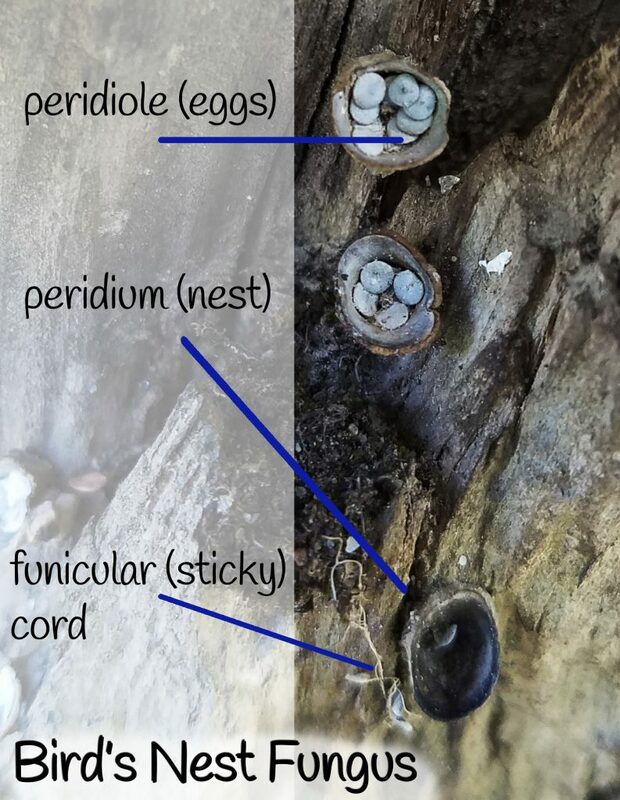 ‘eggs,’ clinging to a dead log at the edge of Deer Creek. Identification investigations revealed something more interesting than ‘just’ insects. Bird’s Nest Fungi – Nidulariaceae, Cyathus stercoreus – mushrooms that use raindrops to propagate. Raindrops aren’t the only way they move from place to place. At the base of the peridiole (spore sack) is a cord that unfurls when disturbed. Like newborn spiders, these cords are long and sticky. They cling to whoever or whatever passes by. Once the peridiole drops off or is eaten and excreted by an animal, the spores are released to begin a new life cycle. The ‘nests’ are approximately five millimeters in diameter, about half the size of a pencil top. 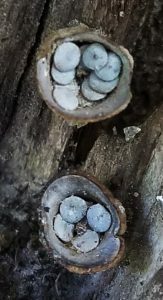 Bird’s Nest Fungi can be seen in late winter and early spring. Look for them in shady places growing on dead or decomposing wood.